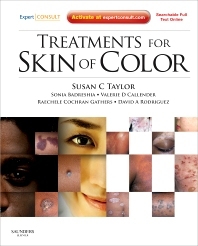 Written to address conditions specifically associated with ethnic disparities in skin types, Treatments for Skin of Color, by Susan C. Taylor, Sonia Badreshia, Valerie D. Callender, Raechele Cochran Gathers and David A. Rodriguez helps you effectively diagnose and treat a wide-range of skin conditions found in non-white patients. Presented in an easy-to-use, templated format, this new reference encompasses medical dermatology and cosmetic procedures and provides you with evidence-based first and second line treatment options. Practical tips and other highlighted considerations minimize the risk of potential pitfalls. A dedicated section examines alternative therapies, some of which have cultural significance and may impact medical outcomes. An abundance of vivid color images and photos provide unmatched visual guidance for accurate diagnosis and treatment. Online access at www.expertconsult.com lets you reference the complete contents from any computer. Get information not found in mainstream dermatology references. Essential medical dermatology and cosmetic procedures as well as evidence-based first and second line treatment options provide you with specific information to treat a full range of conditions found in skin of color. Broaden your understanding of complementary and alternative medicine (CAM) used by your patients. A special section examines the cultural significance and impact on medical outcomes caused by these alternative therapies. Spend less time searching with easy-to-use, templated chapters focused on visual identification and diagnosis of diseases across all skin tones, and recommended treatment options. Make rapid, confident decisions on diagnosis and treatment by comparing your clinical findings to the book’s extensive collection of 270 detailed illustrations. Access the book from any computer at www.expertconsult.com, complete with the full text and entire image bank to further augment mastery of the subject matter.